In our busy day-to-day lives it is easy to say the wrong thing or simply get lazy and communicate on autopilot. Our ability to communicate as a basic human function often becomes so mindless and habitual, it can get overlooked and forgotten. But communicating with conscious effort and awareness is in fact the key to any healthy and lasting relationship. This blog is dedicated to learning how to better communicate within the many diverse relationships of our lives. Now, when I say relationships, I am including the romantic “love” kind, of course. But also, the relationships you have with your family members, platonic friendships and professionals need your time and energy too. Our lives are full of dynamic interactions and no relationship is exactly the same. They can thrive in different environments and require more or less energy, yet all rely on good communication and active listening. Some relationships may initally feel more natural and easier to navigate and maintain than others. But over time, all relationships require effort and attention including your most intimate relationship of all: your relationship with yourself. Who would have thought? We have more conversations with ourselves on a daily basis than anyone else! “Start by following one simple rule: Don’t say anything to yourself that you wouldn’t say to anyone else. Be gentle and encouraging with yourself. How we talk to ourselves inside our heads can have a tremendous effect on how we feel and thus, effect how we interact with the world around us. So, before we can truly master the art of communication in all of our external relationships, we need to spend a little time on ourselves. 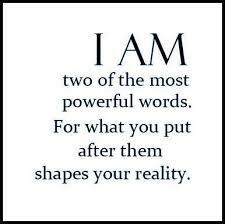 By learning to form conscious and constructive thoughts and saying positive affirmations aloud, we have the power to change the way we think and feel with some basic exercises, training and practice. Both of these definitions help explain Self-Identity from a communication perspective:we learn how to communicate first from our social environment, interactions and especially the feedback we receive from other people around us starting at very young ages. It is those same interactions that help shape our personal identities and self-image. While we continue to learn and further develop our communication skills over time, the imprint of those initial environments and interactions shaped the core of who we believe ourselves to be and how we communicate inside and out. But don’t worry – if your outlook tends to error on the negative side or you suffer from chronic critical self-thoughts, you are not alone and there are ways to combat it. 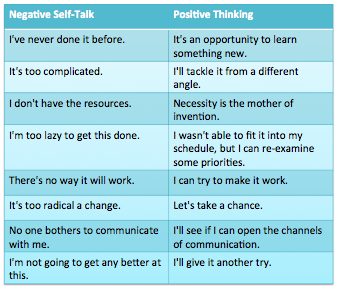 HERE ARE SOME OF THE TIPS LISTED ON THE MAYO CLINIC WEBSITE TO HELP YOU PRACTICE YOUR POSITIVE THINKING AND SELF-TALK. TO VIEW MORE REGARDING POSITIVE THINKING AND SELF-TALK, GO TO MAYO CLINIC BY CLICKING HERE. Healthy relationships start with a positive mindset and thrive with effective communication. So remember, if i flourish, we flourish! Please share how you practice keeping a positive mindset and what has helped you with your self-talk habits in the comments below. Thanks!